Supporters cheer for President Trump during a campaign rally last week in Great Falls, Mont. Interviews with over 50 Republican voters show satisfaction with the president's accomplishments and enthusiasm about this year's election. 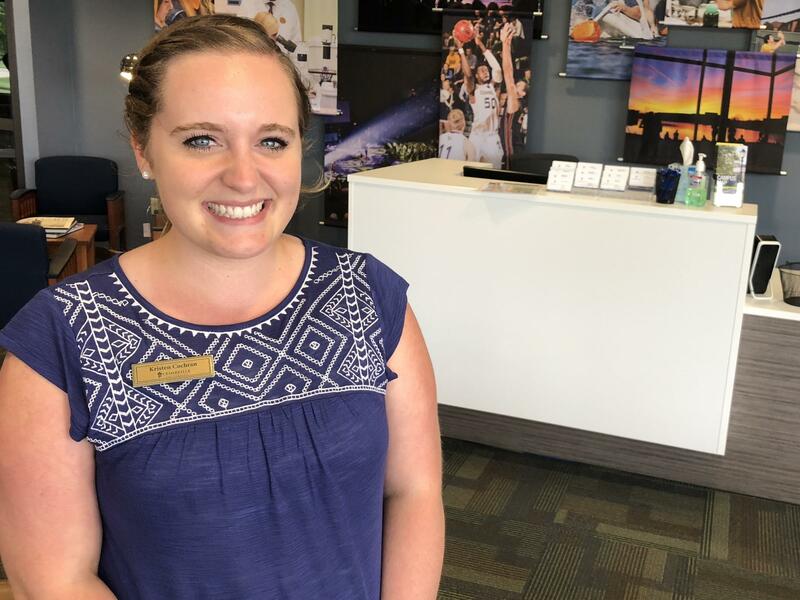 Kristen Cochran, a senior at Cedarville University, a christian college in Ohio, said the president can sometimes be "crass," but she likes how he's governing. "I'm going to say if he keeps doing what he's doing, he'll be the best president of my lifetime," said Billy Neibler, a welder in Grove City, Ohio. Troy "Rudy" Varney, a Vietnam War veteran from southern West Virginia, says he thinks the president's proposal for a military parade on Veterans Day is a "great idea" and that Trump has "the heart" of veterans. Mike Davis didn't think Donald Trump could get elected. Davis is the kind of Republican who backed Ohio governor John Kasich in the 2016 primaries, the kind of Republican who subscribes to the Wall Street Journal. Davis, 64, is the former mayor of Dunwoody, Ga., a small city in the state's 6th Congressional District, one of the most highly-educated districts in the country. Ultimately Davis voted for Trump, mainly because he was worried about the tilt of the Supreme Court. With the nomination of another conservative justice expected on Monday, following the confirmation of Neil Gorsuch in 2017 and a large reshaping of the federal judiciary overall, Davis is getting what he had hoped for. So with time, his tepid support has morphed into a wholehearted embrace of the president. "I love what he's doing with international relations. I love what he's done with the tax code. I love what he's done with the appointment of judges," said Davis. "And to be honest, those three things trump everything in my mind, no pun intended." There is no doubt Democrats are highly engaged this year. A recent study from the Pew Research Center found they are more enthusiastic about the midterms than Republicans. But that same survey also showed that Republicans are more enthusiastic this year than they were in the 2014 midterms, when they won control of the Senate and expanded their majority in the House. Despite other clear signs of Democratic enthusiasm, in the form of high voter turnout in the primaries and large-scale protests of the president, there are increasing indications that Trump's powerful base might offset some of that energy and protect the GOP's power in Washington by denying Democrats the 23 additional House seats or 2 additional Senate seats needed to win control of either chamber. Trump is a bigger factor in midterm preferences — positive or negative — than any other president in the last three decades, according to Pew's research. The president has a near 90 percent approval rating among Republicans. His popularity near the 500-day mark among his own party is higher than any other president since World War II, with the exception of George W. Bush in the aftermath of the 9/11 attacks. Republican strategists and even party leaders say the GOP has morphed into "Trump's party," where the litmus test for admission is loyalty to the president, derided by retiring GOP Sen. Bob Corker as "a cultish thing." But with Trump's name not on the midterm ballot, the question is whether the coalition he built will stay together in November. In interviews with over 50 Republican base voters across Ohio, West Virginia and Georgia in recent months, NPR found widespread enthusiasm for the president that could fuel voters in November. Between immigration, trade, tax cuts and Supreme Court picks, Trump has satisfied distinct parts of his coalition and given them each a reason to come back for more in November. Reactions from voters in four discreet blocs of Trump supporters show why. Jason Loudermilk, a mission strategist with the West Metro Baptist Association in Georgia, wrote in a candidate in 2016 because he didn't feel comfortable voting for Trump. "I wasn't sure he was as pro-life as he said he was," said Loudermilk. But he said the appointment of Gorsuch proved Trump's conservative principles. "Knowing what I know now, if I had it do over again, and nothing changes in the next two years, I'm planning to vote for him for re-election," said Loudermilk. In fact, the balance of the Supreme Court largely solidified white evangelical support behind Trump during the 2016 campaign. And so despite ongoing stories about Trump's personal lifestyle, these days even initial skeptics like Loudermilk have become convinced Trump is on their side. White evangelicals support the president far more than the general public. An April poll from the Public Religion Research Institute showed 75 percent of white evangelicals have a positive opinion of Trump. In comparison, the president's overall approval rating is currently around 42 percent. "I've been amazed at his accomplishments, particularly as you consider all the opposition that he has had from Republicans as well as Democrats, the man is just fighting battles, one battle after another of opposition," said Donald Voyles, 83, a pastor at Unity Baptist Church. And while some evangelicals continue to have reservations about Trump's morality and character, many say now they agree with his policies. "As an individual, there are certain things about him that I don't love, but, I really do believe he is genuine in that he is trying to better America for the future," said Kristen Cohran, 22, a political science major at Cedarville University, a Christian college east of Dayton, Ohio. She still worries that the president is sometimes "crass," and she wishes he would start acting more presidential, but she said her Christian faith is the most important factor in her politics. And, thus far, Trump has delivered. "I think there's things he's working toward, especially crack down on Planned Parenthood, and potentially revert to some of the past prohibitions on abortion," said Cochran. White working-class voters supported Trump over Hillary Clinton by a 2-to-1 margin. In particular, white working class men were among the president's strongest supporters. But their concerns were not solely economic. Polling has shown that blue-collar voters who supported Trump had deep anxiety more about cultural displacement than economic volatility. "Pretty soon it's going to cost us more and more and more to live here in this country because we're keeping them people and feeding them," said James Weekley, referring to immigrants. Weekley, 89, is a retired baker NPR met in Ohio while following Working America, a labor group affiliated with the AFL-CIO, as it canvassed a Columbus neighborhood. Part of Trump's strategy for maintaining power is to give each plank of voters in his coalition something they want, in the hopes they'll keep coming back for more. Widespread deportations may not be popular among the general public, but they are incredibly popular among a core group of Trump's supporters. Before he's even asked about the president, Weekley begins praising Trump's hardline immigration policy. "He's sending some of the foreigners back to where they belong," said Weekley. Over a fifth of Ohio voters are white, working-class men, and while trade and tariffs matter to some, the cultural grievances Trump has tapped into resonate just as deeply. Billy Neibler, a welder in Grove City, Ohio, didn't go to college, but he gets riled up when he hears stories of college campuses creating so-called "safe spaces" for minorities to talk about their feelings of marginalization. "You got to have a safe space?" he asked incredulously. "You know, I get burned all day long. I get burns, I get cuts. I've been called names, and you just say something back or maybe you got into a fist fight over it." Neibler is from Kentucky, but he's lived in Ohio for years. Still, he has at least three Confederate flags in his garage; one giant one hangs on the wall, proclaiming, "The South Will Rise Again." Neibler says the country has gotten soft, and he blames Democrats. Part of Neibler's frustration is tied to entitlement programs. He feels like Democrats want to give stuff away to lazy people for free. And he says that's unnecessary because there are plenty of jobs in Ohio. "Everywhere you go, you see a sign. If you don't want to work in Columbus, it's because you don't want a job," said Neibler. "That's a fact." Like many GOP voters, he credits Trump for a healthy economy, and he insists he's got more business than he's ever had. But his admiration for Trump isn't just about taxes and jobs, it's about power and personality. "I'm going to say if he keeps doing what he's doing, he'll be the best president of my lifetime," said Neibler. Another key part of the Trump coalition are veterans. They broadly supported the president in 2016, and many remain thoroughly satisfied with his job performance. 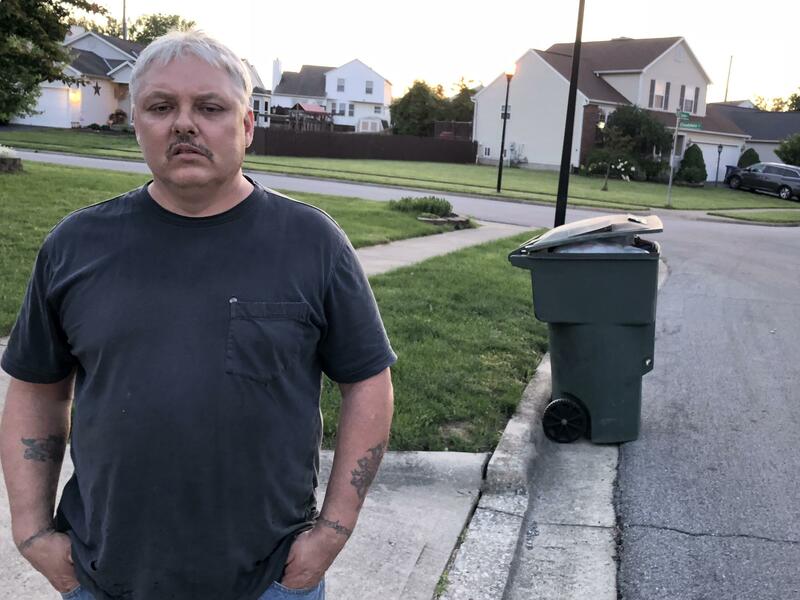 Interviews with about a dozen veterans in West Virginia — a state with one of the highest proportions of veterans in the country, at 9 percent of the population — uncovered widespread support for the president's policies. 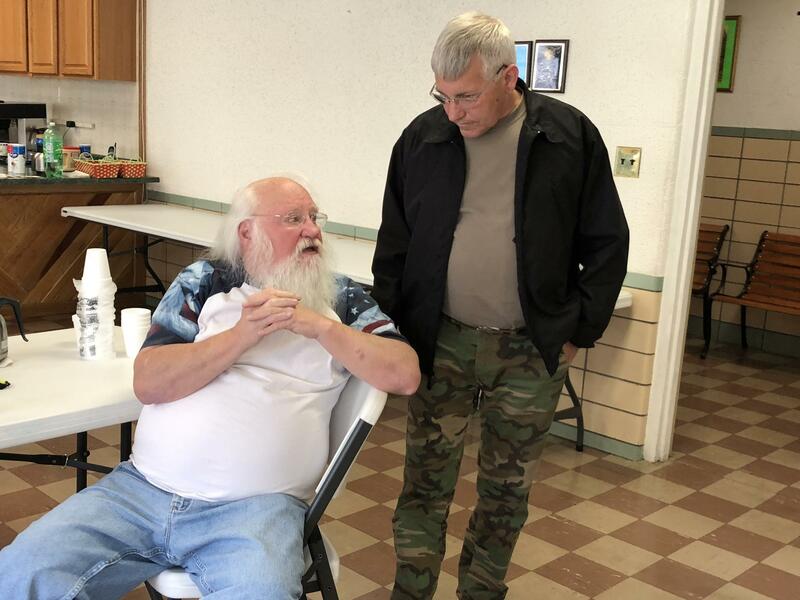 "I think he's done a great job," said Rudy Varney, a Vietnam War veteran in Logan County. "He got the [budget] increase for the military. And our soldiers." But Varney's appreciation of Trump is not just about money — it's about prestige. He loves the president's idea of a military parade on Veterans Day. "All the other countries do that," he said. "That doesn't mean we went plum crazy and ready to raid people's homes or nothing. That's just showing our military force. And letting the public know what the military is all about and their weapons." The parade idea is popular, in part, because it seems to demonstrate how Trump feels about the military. "President Trump seems to have the heart of veterans," said Donnie Wells, another Vietnam veteran. "He's done more in the short time he's been in office than any of the other presidents ... as far as being up front and vocal about the veterans." But the question of how this will translate to the midterms is unclear. Multiple Trump voters also praised Sen. Joe Manchin, D-W.Va., for fighting for veterans issues. Manchin is a well-known retail politician, and one GOP voter specifically cited a health issue that he said Manchin helped him resolve. The president performed worse than many of his GOP predecessors with one traditionally Republican demographic — white, college-educated voters. But those who did vote for him have found a reason to love him more than before. "He's done a great job for the economy," said Sam Ehlers, a tech worker in Cobb County, Ga. "Unemployment is low, taxes have been reduced, businesses are investing and hiring." The tax cuts are almost universally popular among Republicans in the affluent suburbs of Atlanta, with manicured lawns and luxury cars. But there is evidence that, while Trump is solidifying his support with his base, perhaps, he is not broadening it. "I did vote for Trump, and now, it's like I think, 'What did I do?'" said Charlene Kratz, a teacher who was having an early dinner with a liberal friend in Marietta Square. "I'm not happy with the way things have gone with him ... he's said so many racist things." Kratz says that, in hindsight, she thinks the country would have been better off with Hillary Clinton. But Kratz is the exception — the only Republican voter in more than 50 interviews to express regret about voting for the president. Trump has given each of his core constituencies at least a dose of satisfaction, enough that they're willing to overlook what they don't like. Davis, the former Dunwoody mayor, for example, says he doesn't like the president's behavior on Twitter. But he's found a way to justify it. "I think (it's) an excellent way for him to deal with a news media that is hellbent on destroying him," said Davis. "So many reporters have made it clear that their mission is to impeach him, get him declared mentally deficient, whatever they're trying to do." This frustration with media coverage wasn't unique to Davis. In multiple interviews, GOP voters insisted "the media" were on a mission to destroy the president, not giving him credit for a healthy economy or negotiations with North Korea. And the more criticism Trump receives, the more fiercely his defenders protect him, the more loyal they become, and the more eager they are to interpret the midterms as a referendum on the president — that they want to answer with a vote for Republicans. Time now for another Weekend Long Listen. If you've been watching what's happening in the midterm elections so far, you've been hearing a lot of this. UNIDENTIFIED PERSON #1: Last night, the big winner of all the contests was President Donald J. Trump. UNIDENTIFIED PERSON #2: Our party is strong. It is vibrant. But it is fueled by the people who elected President Trump. UNIDENTIFIED PERSON #3: We are the party of President Donald J. Trump. GARCIA-NAVARRO: Usually, a president's party loses power in the midterms as enthusiasm softens. But President Trump has a near 90 percent approval rating among Republicans, and so he thinks his supporters will defy history. He's been tweeting that a red wave is coming in November. To find out just how the president has kept his base so fired up, NPR's Asma Khalid has been traveling the country talking to Republican voters. 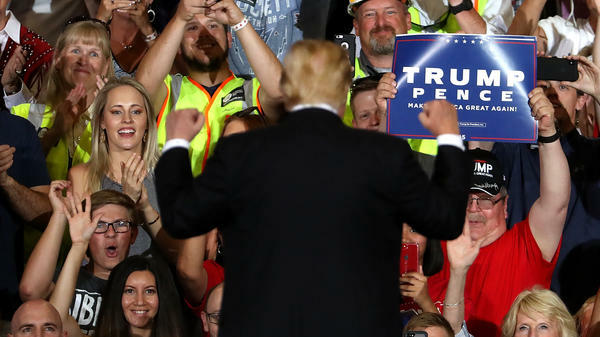 ASMA KHALID, BYLINE: Some of the president's strongest supporters are white, working-class men - people like James Weekley, a retired baker in Columbus. I meet him when I go knocking on doors with Working America - it's a political group affiliated with the AFL-CIO. KHALID: And before I even get a chance to ask Weekley about the president, he begins praising Trump's hard-line immigration policies. JAMES WEEKLEY: Well, he's sending some of the foreigners back where they belong. KHALID: Widespread deportations may not be popular among the general public, but they are incredibly popular among a core group of Trump's supporters. Polling has shown that blue-collar voters who support Trump are anxious about cultural changes. WEEKLEY: Pretty soon it's going to cost us more and more and more to live here in this country because we're keeping them people and feeding them. KHALID: White, working-class men like Weekley are one of four key types of voters in the president's base. The others are veterans, evangelicals and suburban, college-educated Republicans. President Trump is more popular in his party than any president since World War II, with the exception of George W. Bush in the aftermath of 9/11. Between trade, taxes, immigration and Supreme Court justices, President Trump has given each of his core constituencies a reason to say thanks and come back for more this November. And Billy Neibler is eager to thank the president. I pull into his driveway just south of Columbus. And before I even get out of my rental car, I spot a massive Confederate flag in his garage. The South will rise again, it proclaims - never mind that we're in the North. Neibler is originally from Kentucky. He's a welder who thinks the country's gotten soft. BILLY NEIBLER: I've been called names. And, you know, and you just say something back or just - maybe you got in a fistfight. But it wasn't this - you know, college campuses - they've got safe spaces so you can go and cry. KHALID: Neibler admires the president for his power and personality. But he also credits President Trump for the economy. NEIBLER: I'm gonna say if he keeps doing what he's doing, he'll be the best president in my lifetime. KHALID: My next stop is southern West Virginia - a state where nearly 10 percent of the population are veterans. I drive through Logan County to the local vet center, where all but one of the guys I meet voted for Trump. Rudy Varney's a Vietnam War vet. And he says he's impressed with the budget increases Trump has gotten for the military. And he also loves the president's idea of a military parade on Veterans Day. RUDY VARNEY: All the other countries do that. That doesn't mean that we went plumb crazy and raided people's homes or nothing. That's just showing of - our military force and letting the public know what the military is all about and their weapons. I think it's a great thing. KHALID: Along with venerating the military, Varney says Trump is keeping most of his campaign promises, so what's not to like? VARNEY: I agree with most everything he says. I wish he'd stay off tweeter (ph) or something, so everybody'd quit getting mad at him. KHALID: Across many different groups of Republican voters, the No. 1 reason people say they voted for Trump was because they were worried about the tilt of the Supreme Court. And this week, the president seems ready to satisfy their demands with another conservative justice. The balance of the Supreme Court solidified evangelical support behind Trump during the 2016 campaign. So next, I head to the campus of Cedarville University, a Christian college in Ohio. KHALID: And there I meet Kristen Cochran, a political science major who says her faith is the most important factor in her vote. KRISTEN COCHRAN: As an individual, I mean, there are certain things about him that I don't love. But there are things he's working towards, especially a crackdown on Planned Parenthood and to potentially revert some of the past prohibitions on abortion. KHALID: A recent survey showed 75 percent of white evangelicals have a positive opinion of Trump. For some perspective, the president's overall approval rating with the general public is around 40 percent. My last stop is in the northern Atlanta suburbs, home to one of the most highly educated congressional districts in the country, where Trump failed to get a majority of the vote. KHALID: I meet Sam Ehlers at a local festival. And like a lot of people here, he praises the president's fiscal policy. SAM EHLERS: He's done a great job for the economy. Unemployment is low. Taxes have been reduced. Businesses are investing and hiring. KHALID: The tax cuts are almost universally popular among Republicans here. Mike Davis is the kind of Republican who backed Ohio Governor John Kasich in the 2016 primaries. MIKE DAVIS: The fringes of both parties scare me, so I'm not a far-right-winged nut. But I'm definitely on the conservative side on the right side. KHALID: Davis tells me he was initially a lukewarm Trump supporter, but his support has gotten stronger over time. DAVIS: I love what he's doing with international relations. I love what he's done with the tax code. I love what he's done with appointments of judges. And to be honest with you, those three things trump everything in my mind - no pun intended. KHALID: Davis says the one thing he does not love is the president's tweeting, but even that he justifies. DAVIS: I think that that is an excellent way for him to deal with a news media that is hell-bent on destroying him. KHALID: Many voters had some iteration of this complaint - that the media is on a mission to destroy the president. And the more critics attack the president, the more fiercely his defenders protect him. In fact, in interviews with over 50 Republicans across three states, I only met one person who said she regrets voting for Trump. There is no doubt Democrats are highly engaged this year. A recent study from the Pew Research Center found they are more enthusiastic about the midterms than Republicans. But that same study also found Republicans are more enthusiastic this year than they were in the 2014 midterms. That year, they won control of the Senate and expanded their majority in the House. And so GOP enthusiasm fueled by President Trump could undercut Democrats' ambition this year and keep Republicans in power. Asma Khalid, NPR News. Transcript provided by NPR, Copyright NPR.